Every year I try to think of new and creative New Year’s resolutions. They have ranged from “workout 5 times a week” to “be more patient” and even “learn how to be an awesome cook.” Unfortunately they all have one thing in common…I never worked out 5 times a week, I didn’t become more patient, and I definitely order take out more than I should. To be honest, I can’t recall a time that I have been successful in any of my New Year’s resolutions. If you’re reading this and you can relate, that’s probably because only 9% of people actually feel that they are successful in achieving their New Year’s resolution. Fortunately, we don’t have to fail at our New Year’s resolutions this year. 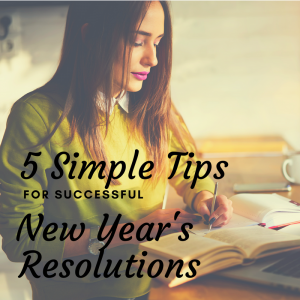 There are ways to set yourself up for a successful new year. Usually when we create our resolutions they end up looking something like “Work out more.” Not only is that not specific, but unless you already are in the habit of working out, that is going to be a really daunting resolution to tackle. Try instead making your resolution “Go for a 1 mile jog 3 times a week.” That small change in how you create resolutions makes them feel more manageable and in turn you are much more likely to succeed. Resolutions can be challenging, sometimes they can be downright difficult and in some cases they’re even painful. Sharing your challenges with a friend who has similar goals can help you not feel so alone when things get tough. It’s also more fun when you get to celebrate your success together! You are 10 times more likely to achieve your goals if you believe you can. Believe in yourself, speak confidently about your goals and develop a set of self-motivating thoughts when things get tough – you can repeat them to yourself, put them on the fridge, write them in your journal or calendar. Most people struggle with ideas of failure – whether you’ve failed in the past (and we all have) or you’re struggling with your current goals, know that none of us are perfect. We will mess up and that doesn’t mean we’ve failed. The key to making long and lasting change is being about to recommit to the goal and the process, take a deep breath and jump right back in. It takes 30 days for something to become a habit so keep pushing forward. Although this may seem like a lot to keep up with, taking it one step at a time can help you succeed and achieve the changes you want. with your New Year’s resolutions If you’ve struggled with identifying goals, finding motivation or creating lasting changes in your life, we would love to help. Click here to schedule your appointment today and get started towards reaching your most desired goals.